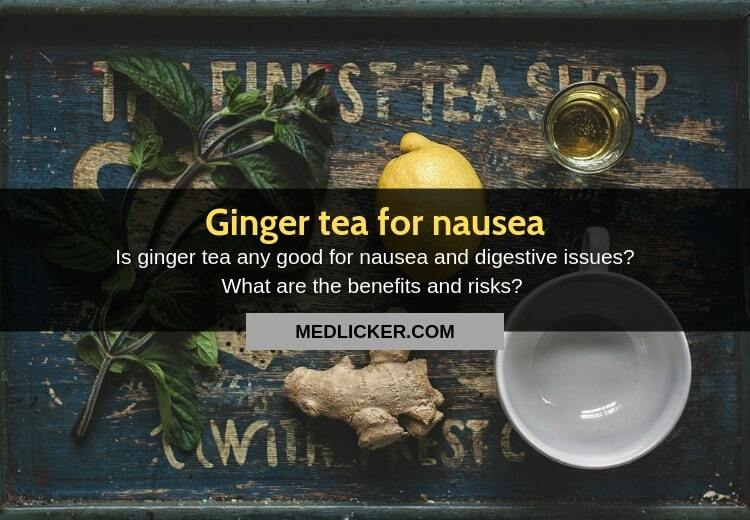 Ginger tea for nausea: the good, the bad and the ugly! Home / Health A-Z / Is ginger tea good for nausea? How to store ginger tea? How much ginger tea a day for nausea? What are the side effects and risks of ginger tea? You will also learn about possible risks and side effects of ginger tea for pregnant and nursing women, including drug interactions of ginger and other information you need if you want to try ginger tea for nausea and vomiting. Ginger is a plant of the Zingiberaceae family, which comes from China and is closely related to turmeric and cardamom. People have been using ginger rhizome (ginger root) as a spice for thousands of years. Doctors also use ginger as a natural remedy for nausea, flu or colds. Some studies even suggest that ginger may lower blood sugar. The main active ingredient of ginger is gingerol, which has potent anti-inflammatory and antioxidant effects and is responsible for most of its healing powers (1). The summary: Ginger is a plant from China, which contains gingerol, a powerful antioxidant used in the treatment and prevention of nausea, stomach issues, flu or colds. Stomach upset is one of the most common health problems in adults and children, but its causes may vary. Sometimes you feel sick because you ate bad food or drank too much alcohol. Children tend to get sick when traveling and pregnancy nausea and vomiting (also called morning sickness) affects up to three-quarters of pregnant women. Nausea and vomiting are also common side effects of surgeries or chemotherapy. Studies suggest that gingerols contained in ginger may help in the treatment and prevention of digestive issues. Analysis of 12 studies involving 1,278 pregnant women confirmed that taking 1.1 - 1.5 grams of powdered ginger daily relieves nausea (2). A systematic review of six studies suggests that taking 1 g of powdered ginger before surgery reduces the risk of postoperative nausea by up to 52% and is even as effective as metoclopramide, a medical drug commonly used for nausea and vomiting (3, 4). Daily ginger doses used in the studies above were about 1 - 1.5 grams. For treatment and prevention of morning sickness (pregnancy nausea and vomiting) doctors recommend a daily ginger dose of 0.5 - 2.5 g taken for a maximum period of 3 weeks (5). It is recommended to take 1-2 g of ginger 24 hours before surgery to prevent nausea and vomitingafter surgery (5). Keep in mind that participants in the above studies took ginger powder rather than tea, so we need additional research on ginger tea to demonstrate its effectiveness in management and prevention of nausea, vomiting, and digestive problems. You may use ginger as a remedy for nausea and digestive problems in many different forms. For example, you can buy ginger pills or capsules in a pharmacy, or you may also get candied (crystallized) ginger or ginger powder. Another option is to sip ginger tea. Here is a ginger tea recipe to relieve nausea, vomiting or other digestive issues. To prepare 1 liter (4 cups) of ginger tea with honey and cinnamon, you need five teaspoons of grated ginger root, honey, lemon, cloves, cinnamon and 1 l of water. Peel the ginger root and grate gently on the grater. Cut one medium-sized lemon and squeeze out the juice. Put lemon juice and grated ginger in a pot and add 6 cloves and one whole cinnamon. Add 1.5 liters of boiling water and let infuse for 5 minutes. Then strain the tea and let it cool down to 60 ° C (140 ° F). Sweeten with honey, season with lemon juice, pour into a jug, let it cool down a bit more and drink. It is best to prepare new ginger tea every day. If you want to get a refreshing drink, you may let the tea cool down, store it in the fridge and drink it cold. The summary: Studies suggest that gingerols (active substances in ginger) may relieve symptoms of digestive problems, including pregnancy or postoperative nausea. The easiest way to take advantage of the healing effects of ginger is to drink ginger tea. To make some, you will need grated ginger, cinnamon, cloves, lemon, honey, and water. There is no official recommendation on the amount of ginger tea allowed, but most doctors recommend not to exceed 3-4 grams of ginger extract per day (1 gram for pregnant women). Half a teaspoon of grated ginger per 1 liter of water is equivalent to 1 gram of ginger extract when making ginger tea. Therefore, if you want to use ginger tea as a remedy for pregnancy nausea, you should not drink more than 1 liter of ginger tea or ginger water made with just 1/2 teaspoon of grated ginger. To relief nausea in people who are not pregnant, you may drink ginger tea prepared from 1.5 - 2 teaspoons of grated ginger in 1 liter (4 cups) of water. The summary: Pregnant women should not drink more than 1 liter of ginger tea prepared from half a teaspoon of grated ginger. Other people can drink ginger tea made from 3-4 teaspoons of grated ginger per 1 liter of water. Side effects of ginger include rash, flatulence, heartburn, stomach irritation, or burns to the oral cavity. It is important not to exceed the daily allowable amount (up to 4 grams for the general population, up to 1 gram for pregnant women). Breastfeeding mothers should not consume ginger at all because we do not have enough information about the effects of gingerol on breastfed babies. Doctors also do not recommend to give ginger to children under the age of two. Although studies suggest that 1 gram of ginger per day does not increase the risk of miscarriage or harm to the unborn child, we recommend that pregnant women talk to their physician before regular ginger tea drinking (6). Also, you should not drink ginger tea if you take certain medicines, including blood thinners, blood pressure (calcium channel blockers) or oral antidiabetic drugs, such as metformin. The summary: Side effects of ginger include rash, heartburn, or stomach irritation. Breastfeeding women and children under two should not drink ginger tea at all. Ginger tea may also interact with certain medical drugs so ask your physician for advice if you take any medicines or supplements. Ginger tea may be helpful in the treatment and prevention of digestive issues, including pregnancy and post-surgery nausea. However, you must not exceed the maximum allowable daily dose of ginger, which is 1 gram for pregnant women and 4 grams for other persons. Since ginger may also have side effects and interact with some medicines, always consult your doctor first before you start consuming it regularly.